The time has come. The time to explore one of, if not the most, popular and widespread breakfasts in the whole world. Fasten your seatbelts, because in this #8 installment of the “Breakfast around the world” post series we are heading to the country of wine, amazing food, culture, fashion, and many more – France! 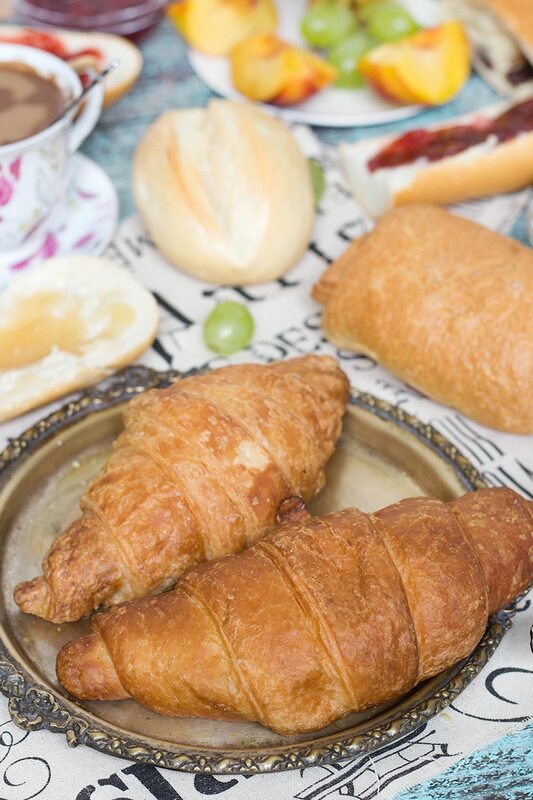 Even those people who have never been to this country before, would be able to name such cornerstone French breakfast table items as croissants and baguette. These baked goods have gained such a huge popularity that you can find them almost in every country all around the world. But what else French love to have in the early morning? Let’s find out! Let me start by saying that French breakfast is a modest one. When I did the Spanish Breakfast some time ago, I told you that it’s very light. Well, comparing to the French, it’s like a feast! Spaniards at least have eggs in a form of their famous potato tortilla (omelette), while you won’t find any on the French breakfast table. 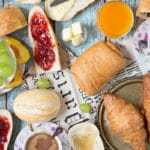 We could compare it with the eggless Brazilian Breakfast, but once again French decided to stand out – they don’t like any savory items for their early morning meal. That’s right: no cheese, no ham, I am not even talking about bacon. Only sweet things! It’s not like French people are not into savory food. In fact, French cuisine was always known as a very rich and savory one. They just don’t like such food first thing in the morning. By the way, if you want to order breakfast in France, you should ask for le petit déjeuner. The literal translation is “a little lunch”. Therefore, after the le petit déjeuner (breakfast) goes déjeuner (lunch). A little bit confusing right? So don’t forget to say “le petit” or you will be served with lunch! Alright, enough talking, let’s see what I have prepared for my French breakfast table today! It is widely known that France has a strong bread culture. Not only bread, but baked goods in general. French have the centuries old baking traditions hence the huge number of bakeries all around the country. In France people love visiting bakeries in the morning to get some bread for their breakfast. The early morning meal wouldn’t be complete without it. That’s for sure. If you think that baguette is the only bread French people eat, you are totally wrong. It’s more like a city thing, while in rural areas people prefer Boule de Pain – a round loaf, which doesn’t go stale as quick as baguettes do. I have both of them on my breakfast table and yes, sometimes the fact that baguette is almost uneatable the other day drives me crazy. Me and my wife, we are weak eaters, so it’s quite complicated to finish the whole baguette in a day for us. In such a case Boule de Pain is a more practical choice. Oh, one interesting fact related to Boule de Pain. French bakeries, that are highly popular among both locals and tourists, got their name (boulangerie) from this bread. As you see, it’s not everything about baguettes in France! Of course there are more bread varieties in France. You can see the small French bread rolls on my breakfast table too. I found them in my local supermarket, and that’s exactly how they were labeled. These are so good! Just to be clear, I bought all the bread you can see on the photo: baguette, Boule de Pain, and French bread rolls. 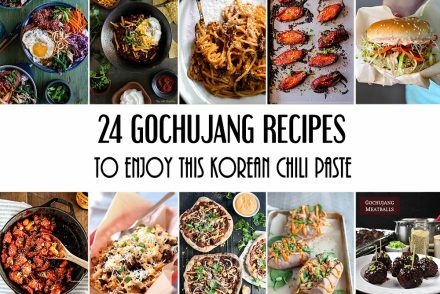 I have never tried making any of these at home. I am sure it’s possible, but why bother, if they are easily found at the local supermarket. If I were able to find them in my small country, so will you. French people don’t just eat plain bread for breakfast, they cover it with various condiments. The most popular is butter. Bread and butter is Pain beurré in French. It’s the combination you will find on every French breakfast table. 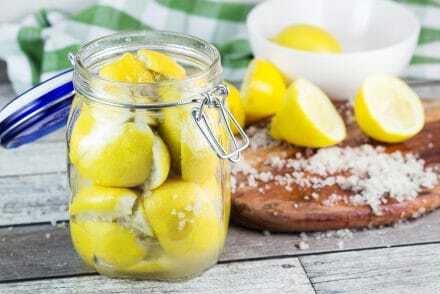 Another beloved condiment is jam (confiture). I slathered my baguette with a generous layer of the strawberry jam. Yum! Honey (miel) is also an option. It reminded me my childhood. Yup, just butter, jam, and honey. Simple? Yes. Delicious? You bet. Here we go. My favorite category! France is famous for its pastries for a reason. Many different shapes, tastes, and they are all so delicious you quickly develop an addiction. I had a chance to visit France few times in my life, and every single time I was stunned by how good their pastries are. My mornings in this beautiful country always started with a visit to boulangerie to get some fresh croissants, éclairs, and a bunch of other goodies. What? Sweet pastries for breakfast? That’s right. French people LOVE their pastries early in the morning. Not all of them, though. For example, I don’t think they have éclairs for breakfast, it was purely my choice. They do love their famous puffy, melting in your mouth croissants straight from the bed, but not every single day. It’s more like a weekend treat. For me, however, it was a daily choice. I don’t count calories while I am on vacation! It’s awesome that croissants are so popular nowadays that you can find them almost everywhere in the world. All my local shops have them. Of course they don’t taste as good as the ones I had in France, but it’s still better than nothing. OR you can try to make them at home. 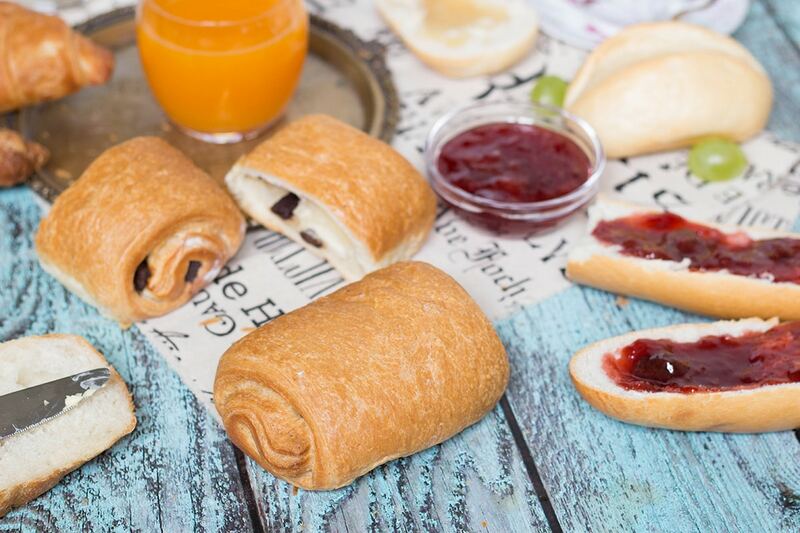 Another popular breakfast pastry is Pain au chocolat – a sweet roll with few pieces of dark chocolate inside. I was able to find them in one of my local shops, so you can see these beauties on my French breakfast table. Once again, the ones I tasted in France were heavenly – perfectly soft, chocolatey; on the other hand, the ones I bought in my local shop had like a drop of chocolate in them. Oh well. All the food is always the best in the country of its origin, I guess. The staple morning drinks you can find all over the world are no different in France. Coffee, tea, hot chocolate, and juice. It should be mentioned that while you can have any coffee you like, the most popular option is café au lait – coffee mixed with hot milk. 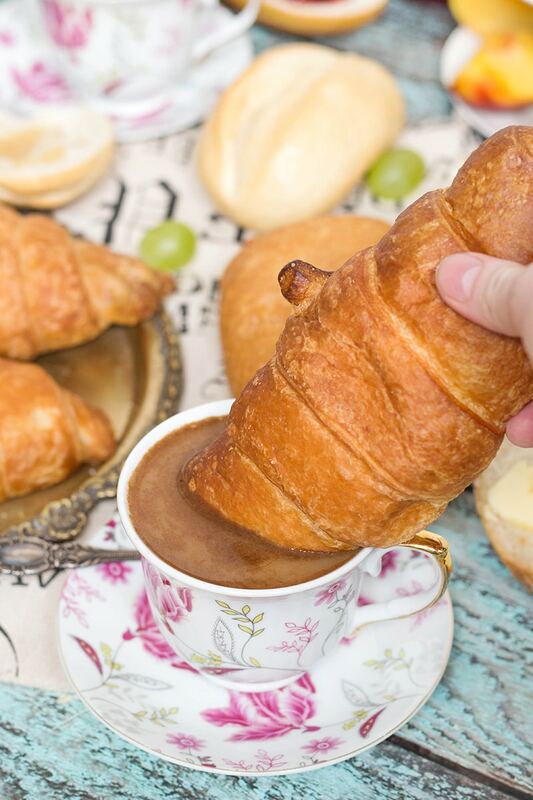 Children and some grown adults also use their coffee or hot chocolate (chocolat chaud) to dip their croissants into it. LOVE IT! 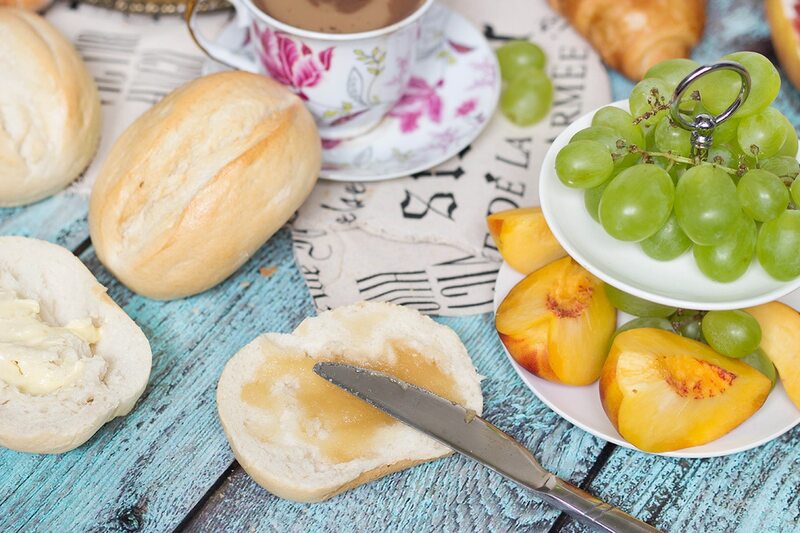 Some fresh fruit can also be found at the French breakfast table. That’s pretty much it! To conclude, I would absolutely LOVE to start every single morning with a breakfast like this. 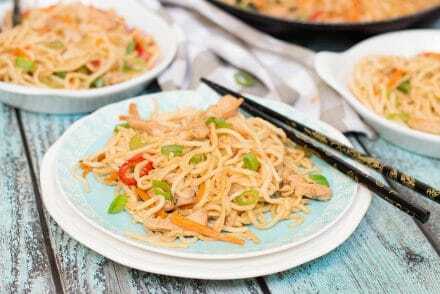 Simple, quick and delicious. Bread and pastries are things I can’t live without, so it’s right up my alley. Thank you France, you are fantastic! See you in other “Breakfast Around the World” posts! 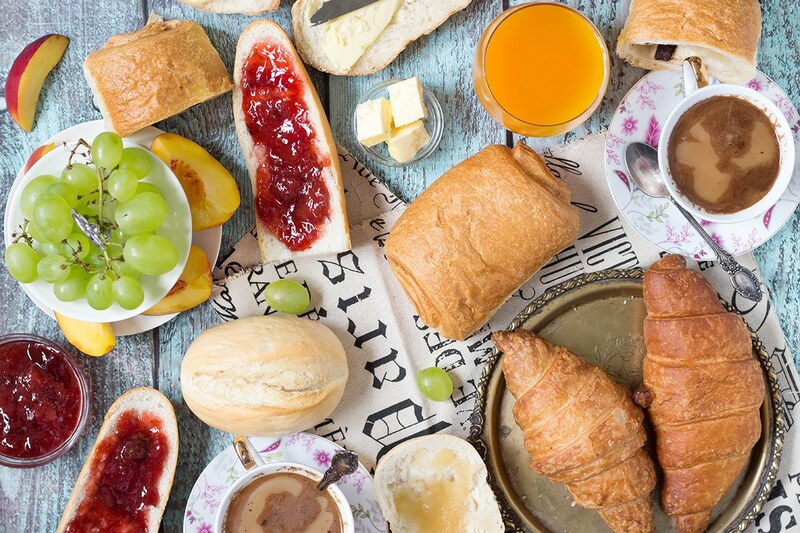 French Breakfast is one of the most popular ones in the whole world. I can understand why. Their famous baguettes, croissants, and other pastries are to die for! 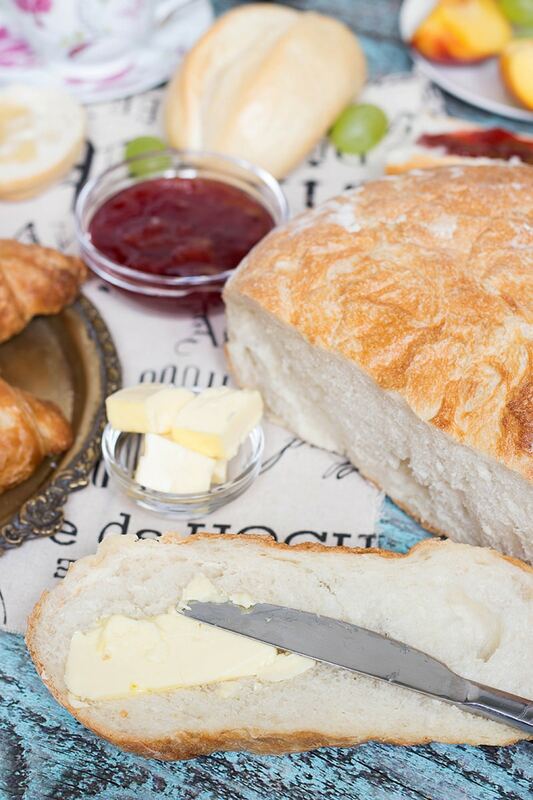 Serve all the items and enjoy your traditional French breakfast! Love that wood board, looks lovely! Can I ask where you got it? Igor, I love your objective. Really fun to explore Countries/the world through food. This looks very much like a typical French breakfast. I LOVE French breakfasts! When I was staying in Paris in a quaint little hotel near downtown, they served the most amazing variety of foods and pastries. It was heavenly! What a fun series! I remember the fresh chocolate croissants delivered to my room when I visited Paris. And the butter- to die for! This is such a great idea to recreate at home. Oh this looks so divine! pain au chocolat is one of my favourites and croissants? I’ll take it to go. This could be my breakfast every morning! I like the French breakfast idea! Yes, I absolutely agree. I’ve tried pastries in various countries all around the world, but French ones are hands down the best! If I may, as a french person, ‘pain au chocolat’ is actually called ‘chocolatine’ in the south-west of France (and in Canada too, i think?). Which is, in my south-western opinion, a way better name than ‘pain au chocolat’ which would just mean chocolate bread. Although if you’re staying in Paris and you order a chocolatine, they might be petty enough not to serve you anything until you call it a pain au chocolat. 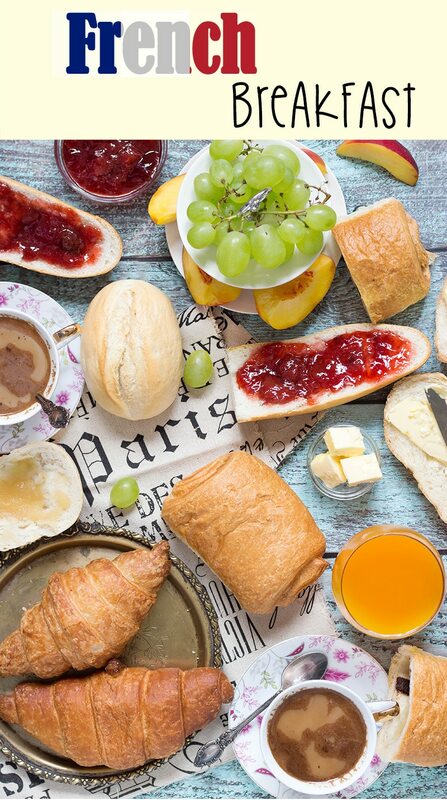 What the French call breakfast and lunch varies by region 😛 «le petit déjeuner» means breakfast everywhere; but «déjeuner» in most french speaking countries and in some regions of France also means breakfast, they would call lunch «dîner» which would be supper for people who call lunch «déjeuner». Supper would be «souper». Another popular french staple where I live is the «abricotine» and «croissant aux amandes», an apricot filled pastry and almond croissant.